A Duquesne University School of Pharmacy faculty member has developed the content and written a chapter for an American College of Clinical Pharmacy (AACP) publication. 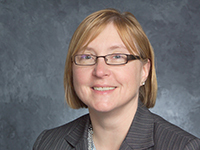 Dr. Christine O'Neil, Assistant Dean of Curricular Development and Interprofessional Education for the School of Pharmacy and AACP Faculty Panel Chair, is credited with the development of a Pharmacotherapy Self-Assessment Program (PSAP) entitled Pediatrics/Geriatrics. As Faculty Panel Chair, Dr. O'Neil was responsible for recruiting authors and reviewers for the publication, as well as monitoring progress and providing reviews. She authored a chapter on Pressure Injury and Wound Care, and she was able to provide writing opportunities for several other School of Pharmacy faculty members: Dr. Branden Nemecek, Dr. Jordan Covvey, Dr. John Tomko, Dr. Holly Lassila, and Dr. Karen Fancher. The PSAP presents evidence-based management strategies for disease states affecting the pediatric population, as well as chapters on management of conditions and public health concerns common in geriatric patients. In addition to Dr. O'Neil's chapter on pressure injury, the publication contains chapters on Acne Vulgaris, Sickle Cell Disease, Chronic Respiratoy Disorders in Children, Attention-Deficit/Hyperactivity Disorder, Gout and Hyperuricemia, Vertigo, and Public Health Concerns with the Aging Population.